One of the most powerful ways to develop your child's literacy skills is also the easiest: talk to your kids! When you talk with them, you can help them expand their vocabulary. At age four, kids can begin to understand and answer more complex questions ("why"), use new spatial words to describe what they see (next to, above) and describe the process they used to do something (how they solved a puzzle). At this age, they are learning the give-and-take of conversations — taking turns and building on someone else's ideas. Questions are great conversation starters and can help kids explore their thinking. Questions are great conversation starters and can help kids explore their thinking. At this age, kids enjoy the "which do you like better" game. For example, "Which do you like better: swings or slides?" Follow up with "Why?" to encourage them to clarify their thoughts. What smells fragrant and what reaks? There are so many smells around us; have your child describe the smells he or she encounters! Kids love to look at photos of people they know and events they've enjoyed. Kids love to look at photos of people they know and events they've enjoyed. As you flip through photos together on your phone or in an album, share stories and memories! Making a book about your family can be a fun way for your child to learn about family history and traditions. When your child shares an observation, expand on what he notices. When your child shares an observation, expand on what he notices. You can help him feel heard while teaching new information and vocabulary. When your child points out the full moon, take a moment to talk about the cycles of the moon. When your child notices a stop sign, make it a game to find and identify other traffic signs. Creating a map of your neighborhood can help your child develop literacy, spatial awareness, and map reading skills. Together with your child, take a walk around your neighborhood to complete this super street map activity. In the age of the smartphone, the answers to many of your child's "Why?" questions are in your pocket. In the age of the smartphone, the answers to many of your child's "Why?" questions are in your pocket. When kids stump you, use it as an opportunity to say, "I don't know. Let's look it up!" But before going online or to the bookshelf, first ask your child, "What do you think?" Hearing spatial language helps toddlers and preschoolers develop their spatial reasoning skills. Hearing spatial language helps toddlers and preschoolers develop their spatial reasoning skills. Spatial language includes references to shapes (triangle, square), sizes (tall, wide), features of shapes (corner, edge) and orientation (above, below, near, between). Help your child by using these words to describe daily activities. For example: "I see some round grapes that fell under the table. Let's put them in this bowl." Talk out loud to your child as you select items and put them in the cart. Talk out loud to your child as you select items and put them in the cart. Name foods as you pass them in the aisle and use new words to describe the food. "These bananas are so yellow and ripe. We can have these for lunch. Let's put those ripe bananas down gently so they don't get bruised." What letter does "apple" start with? Let your child practice beginning letters and sounds by creating weekly grocery lists together. In this activity, you and your child can create your own obstacle course and then practice using spatial language such as 'over, under, and around' while navigating the course. In this activity, your child can have fun learning about compound words by cutting out or drawing pictures of simple words and pairing them together to make new words. Power Words have the power to stop villains! Your child can learn new vocabulary by choosing the right word to solve sticky situations. 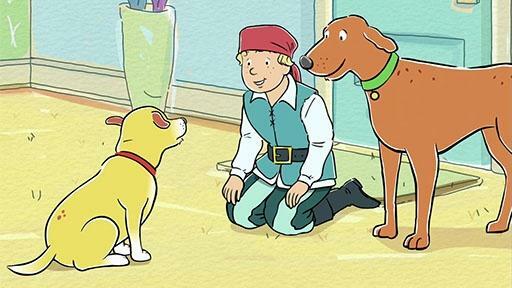 Your child can learn about figurative language and helping friends in this clip where T.D. wants to cheer up Martha. 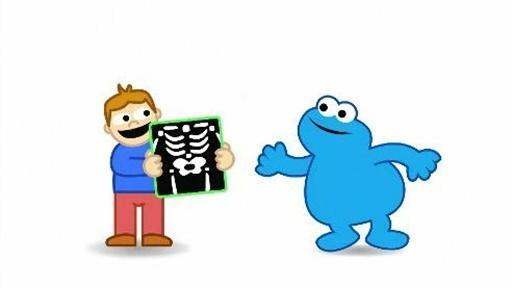 In this musical clip, Cookie Monster teaches about words that start with the letter X sound, like "X-RAY!